Nintendo has revealed more about the virtual reality experiences that you can build and interact with in the Nintendo Labo VR Kit. These experiences have all been designed to be shareable, fun, and social, with each Toy-Con once again looking to combine tactile feedback in the real world with virtual adventures. The Toy-Con Wind Pedal, for example, produces a blast of air to recreate the feeling of flying, whereas players can charge the Toy-Con Blaster before launching a volley of lasers (or fruit). Bird: Soar through the sky on a bird’s back, collecting items and helping baby birds hatch along the way. When using the Toy-Con Bird, players can flap its wings. But a tap of the Toy-Con Wind Pedal delivers a surprisingly strong puff of air to the player as the bird in the game gets an extra boost of speed. Bird Dash: Compete in timed challenges by racing through checkpoints as you fly through the sky. Blaster: Battle an alien invasion and giant bosses in an on-rails experience that requires sharp reflexes and a keen eye. Kablasta: Challenge a friend to competitive hippo feeding! Fling different types of fruit toward the hippos to lure them toward your side of the pool and score the most points. House Camera: Interact with the strange creature living in the house – which some people may recognize from the Nintendo Labo: Variety Kit! – and complete missions by taking photos in its mysterious home. Ocean Camera: Dive into the deep blue virtual sea and complete objectives like taking photos of sea life. The ocean is full of surprises. Doodle: Create colorful 3D artwork by moving the trunk of the Toy-Con Elephant through the air, using various in-game tools and styles to bring your creations to life. Once finished, show off your masterpieces on the TV by docking your Nintendo Switch. An additional multiplayer game lets players take turns drawing and guessing each other’s drawings. Marble Run: Try to complete physics-based puzzles by using various objects to guide marbles through rings. You can even create puzzles of your own to challenge friends and family. Hop Dodge: As a frog, jump as high as you can on an ever-growing stack of colorful balls while avoiding obstacles and heading soccer balls. The wind resistance from the Wind Pedal will make you feel as though you’re actually experiencing a breeze. VR Plaza: Enjoy 64 bite-sized games and experiences in VR Plaza, including platformers and puzzlers. Many of these experiences can be enjoyed using only the Toy-Con VR Goggles and Nintendo Switch system. You can then use Toy-Con Garage as well as the new Toy-Con Garage VR to create your own VR games and experiences, which the development team used to create the 64 bite-sized games and experiences for VR Plaza. When the Nintendo Labo VR Kit releases next month, it will be available in two configurations – one that contains all the Toy-Con creations, and another with a few for you to get started with. 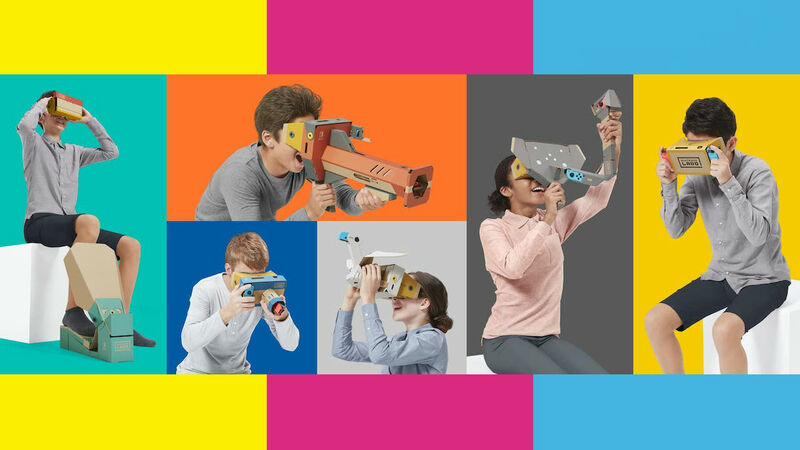 The Nintendo Labo VR Kit ($79.99) will include the software and materials to build all six Toy-Con projects – the Toy-Con VR Goggles, Toy-Con Blaster, Toy-Con Camera, Toy-Con Bird, Toy-Con Wind Pedal and Toy-Con Elephant – as well as a Screen Holder and Safety Cap. Whereas the Nintendo Labo VR Kit Starter Set + Blaster ($39.99) will have the software and components to build the Toy-Con VR Goggles and Toy-Con Blaster, as well as the Screen Holder and Safety Cap. And then, for those that choose the Starter Set, you can expand your experience with the Nintendo Labo VR Kit Expansion Set 1 ($19.99) and Nintendo Labo VR Kit Expansion Set 2 ($19.99) – which come with the Toy-Con Elephant and Toy-Con Camera or Toy-Con Wind Pedal and Toy-Con Bird, respectively. The Nintendo Labo VR Kit Starter Set + Blaster, complete Nintendo Labo VR Kit, and Expansion Sets will release at retail worldwide on April 12th.